Although many of the Southwestern Pueblo Indian Nations have adopted Christianity, ancient ceremonies and traditions have been preserved. 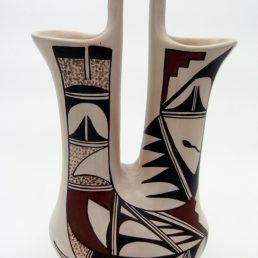 In the case of marriage ceremonies, Native American Indians often practice both Christian and ancient rituals, including the exchange of the traditional wedding vase. 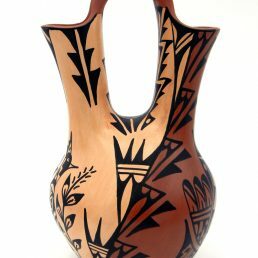 Regardless of whether or not a Pueblo uses a wedding vase during a traditional Native American Indian marriage ceremony, nearly all Pueblo pottery artists create them. 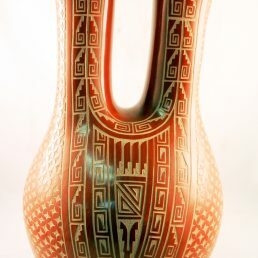 Indian wedding vases, then, reflect the various styles and designs characteristic of each Pueblo. 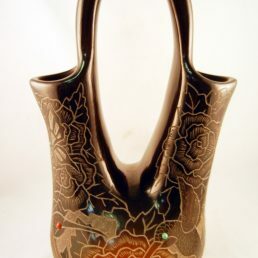 However, all Indian wedding vases have some features in common: two openings (drinking spouts) are connected by a single handle. 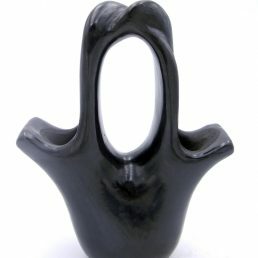 The two spouts symbolize the two individual lives, and the handle symbolizes the union of these two lives in marriage. Traditional wedding vases are made by the groom’s parents about a week or two before the Christian marriage ceremony. When the vase is complete, the groom, accompanied by his parents and other family members, presents it to the bride at her home. The bride gathers everything she will need to begin a new household with her husband, and the parents of the couple give them advice for a happy and successful marriage. Indian holy water is then placed in the wedding vase, which is turned and offered to the bride. 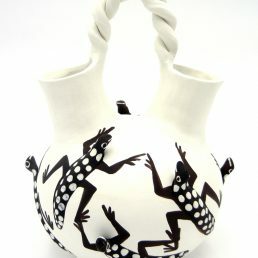 She drinks from one spout, turns the vessel and offers it to the groom who drinks from the opposite spout. This simple exchange unites the pair as a married couple. Ceremonial Indian wedding vases are treasured and protected for the entire married life of the couple. 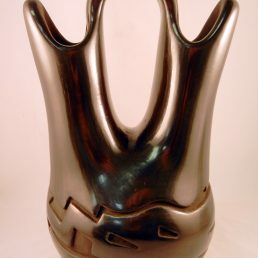 If one spouse outlives the other, it is tradition to present the wedding vase as a gift to another couple as a way to celebrate their happy married life. 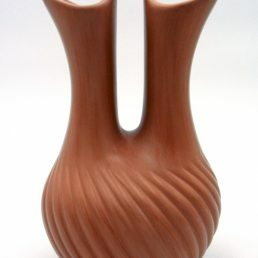 These vases are never sold, even as works of art. 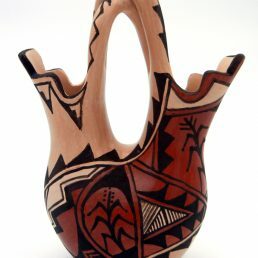 Native American pottery art wedding vases make a truly unique wedding gift for a new couple or an anniversary gift to a couple enjoying their married life. 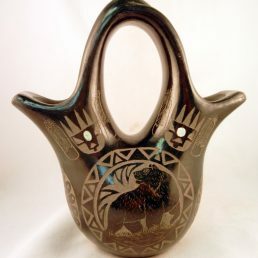 Palms Trading Company has a selection of Native American Indian wedding vases created by Hopi, Navajo, Santa Clara and Santo Domingo Pueblo artists in our online collection, and more in our store. If you’d like to see more traditional wedding vases, please contact us to use our personal shopper service.